Are you experiencing anger, sadness, nostalgia, selfishness, jealousy, or do you have a heartbeat? An ABC to read, to look at, but above all to feel, this book will help you understand your emotions and express your feelings. A picture book which comes in a special format and which lists feelings and emotions following the letters of the alphabet, through words and images which are delicate and intense at the same time. 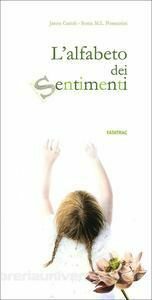 Janna Carioli’s delicate and funny verses brilliantly succeed in representing the different nuances of feelings. Such nuances are also present in Sonia Possentini’s illustrations, which enrich the poems, through colours, lights, and shadows, as well as with the gestures and expressions of the boys and girls represented. One of the few poetry books that has the merit of talking to boys and girls about emotions, starting from their point of view. One only flaw: the generic masculine is used to refer to girls as well, although they are well represented in this book through illustrations.